One of our visitors recently told me about the world’s first Van Gogh musical which just opened this summer. 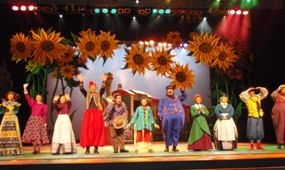 Produced by COA Productions, Van Gogh and the Sunflower Boy is a musical adaptation of Camille and the Sunflowers by Laurence Anholt. This production focuses on Van Gogh’s time spent in Arles and many of the people he met during that time. Van Gogh and the Sunflower Boy is currently being performed for the next couple of months in Seoul, Korea before touring China and Japan. Read more from Laurence Anholt himself on this production or if you read Korean more information can also be found here. I am just working on a musical based on the life of Van Gogh called Letters. I had no idea someone had already done it. 🙁 Lame. Oh well I am going to finish it.